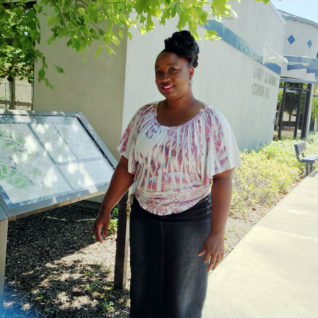 Jannika graduated from Contra Costa College recently, but she first came here back in the late 90s, when she took a dance course to satisfy a high school PE requirement. When she graduated from high school, Janikka didn’t go right to college. Instead, she went to work as an aide in a special education classroom. She took a few courses at another community college in order to meet work requirements, but didn’t complete a certificate or degree program. Then, like a lot of people, Jannika was hit hard by the 2008 financial crisis. She also began to notice that education was becoming more important in the workplace, as jobs that previously only required experience suddenly demanded bachelor’s degrees. So, in 2010, she came back to CCC to take a few core classes and become more competitive in her field. During one of Dr. Intisar Shareef’s Early Childhood Education classes, Jannika decided to stick around and get a degree. Jannika had trouble reading, so she had to take some beginner courses. She also took a lot of time off between semesters. But, she says the passion of instructors like Dr. Shareef and Sandra Moore inspired her to keep going. The Friday before one spring break, Jannika went into labor with her youngest child. The Monday after break, she was back in class. A few weeks later, she graduated with honors, associate degrees in Liberal Arts and Early Childhood Education, and four certificates of achievement. Now, Jannika is a Behavior Therapist with Kids Overcoming. She develops and implements treatment plans for autistic children, working directly with them in their homes and schools. She plans to continue her education at a four-year university and eventually open her own childcare center. Jannika’s advice for anyone thinking about continuing their education is to stick with it, even if you move at a slower pace.